A total of 56 million mobile subscribers makes Spain one of the largest mobile network markets in Europe. Telefónica’s Movistar has the most subscribers, while Vodafone and Orange are constantly com­peting for the second rank. Yoigo has star­ ted to grow under its new ownership. So, the 2016 P3 connect Mobile Benchmark Spain promises interesting results. Which network is the best choice for voice and for data communi­cation? Which operator scores best in quality and performance? The 2016 P3 connect Mobile Benchmark in Spain shows clear improvements, both in the scores and KPIs of all four contenders. The overall ranking of Spain’s operators, however, does not present many surprises. P3‘s network benchmarks are widely accepted for setting industry standards as well as being highly objective. The carefully designed methodology scheduled four drive-test cars to visit 14 large cities and 26 smaller towns in Spain as well as the roads and motorways connecting these municipalities. The test routes also included the islands Tenerife and Gran Canaria. The areas in which we tested accounted for more than 11 million people, or approximately 23.8 per cent of the Spanish population. One aspect of P3‘s great attention to detail is the use of up- to-date LTE “Cat 9“ smartphones for the data tests, which accounts for the latest technical developments such as LTE carrier aggregation. Another factor is the use of the most comprehensive mobile plans available from each operator. 2016‘s results see an overall improvement in performance levels – each operator was able to gather more points than in last year‘s mobile network benchmark, although we have increased thresholds and requirements to reflect the general technical development. Like in 2015‘s P3 connect Mobile Benchmark in Spain, the overall winner is Vodafone with strong results both in the voice and data categories. Vodafone‘s improvements in the data category are even more impressive than in the already strong voice discipline. Movistar comes in as a strong second and also shows respectable results both in the voice and data disciplines. Like Vodafone, Movistar has improved more distinctly in the data category than in voice. Orange ranks third, but achieves the same voice score as its constant rival Movistar. Both networks fully deserve their overall grade “good“. Yoigo ranks last with a clear distance to the other three. In spite of its only “sufficient“ result, the smallest operator has improved in the voice category, but stagnated in the data section. The Spanish mobile network market is highly competitive: Vodafone and Orange regularly contend for the second position in market share, and as of June 2016 the smallest operator Yoigo has a new owner. Movistar is the brand name that the Spanish telecommunications company Telefónica uses for the mobile network in its home market. Telefónica itself is one of the largest telco companies in the world. The operator is present in 21 countries with a total of 130,000 employees and achieved worldwide revenues of over €47 billion in 2015. While the company introduced the Movistar brand in Latin American countries in 2005, it has been active in Spain since the launch of GSM services back in 1995. Today, Movistar is the largest mobile operator in Spain with about 17.1 million subscribers, which equals a market share of roughly 30 percent. It offers GSM service at 900 and 1800 MHz, UMTS/3G at 900 and 2100 MHz and LTE at 800, 1800 and 2600 MHz. Since the end of 2014, Movistar has supported 4G carrier aggregation – which means that suitable smartphones can combine LTE frequencies for higher bandwidth. Vodafone España has been present on the Spanish mobile communications market since the year 2000. Then, the British Vodafone Group acquired Airtel Móviles which had operated in Spain since 1994. In Spain, Vodafone now has 14.1 million mobile customers, which adds up to a market share of about 25 per cent. In the fiscal year 2015/ 2016, Vodafone Spain achieved revenues of €4.5 billion which contributes about nine per cent to the whole Vodafone Group‘s financial result. Vodafone‘s mobile network in Spain offers GSM service at 900 and 1800 MHz, UMTS/3G at 900 and 2100 MHz and LTE at 800, 1800 and 2600 MHz. The Vodafone mobile network in Spain supports LTE carrier aggregation of its 1800 and 2600 MHz frequency bands. The company offers LTE downlink speed with up to 300 Mbps and calls this service “4G+“. This service is available in all large cities including all provincial capitals as well as in many rural areas. Vodafone España continues to upgrade its mobile network sites to this “LTE Advanced“ standard. Orange España is the brand name of France Telecom‘s mobile network in Spain. It has been operating under this name since 2006. Previously, the network was known as “Amena“ – this brand name lives on in Orange Spain‘s portfolio as a low-cost offer that is only available on the internet. Also, its network serves a number of mobile virtual network operators such as MasMovil, Carrefour Móvil and others. With 12.8 million customers, Orange is the third largest Spanish mobile operator – its market share includes about 23 percent of the population. In the fiscal year 2015, Orange Spain achieved a revenue of €4.2 billion which contributed 10.5 percent to the whole Orange Group‘s 2015 results. Orange Spain has deployed 2G networks at 900 and 1800 Mhz, 3G networks at 900 and 2100 MHz and 4G at 800, 1800 and 2600 MHz. Orange offers “4G+“ or “LTE Advanced“ with data rates of up to 200 Mbps in most larger cities including all provincial capitals. Yoigo was the latest mobile operator to enter the Spanish market. Founded in the year 2000 under the name Xfera, the company started its actual operation in 2006, offering only a UMTS/3G network at 2100 MHz. At this time, the Swedish telecommunications company TeliaSonera acquired the majority of shares and re- branded the network as “Yoigo“. This name was supposed to reflect the simplicity and ease in rates as well as in the use of the service. In June 2016, the former MVNO (mobile virtual network operator) Más- móvil bought the company. Yoigo has a national roaming agreement with Movistar until the end of 2016, which is scheduled to switch to Orange in January 2017. Following the merger with Másmóvil, the customer base has increased from 3.7 million former Yoigo subscribers to approximately 4.2 million, which equals a market share of 7.5 percent. In July 2013, Yoigo started the deployment of a 4G network at 1800 MHz. Its LTE coverage now includes all major Spanish cities and most of the provincial capitals. In 2015’s mobile network benchmark, Vodafone was the clear winner, followed at a distance by Movistar and Orange with Yoigo in last place. How do these competitors score one year later? P3 communications GmbH, based in Aachen, Germany, is a world leader in mobile network testing. It is part of the P3 group, with over 3000 employees worldwide and a turnover of more than €300 million. P3 is partnering with the German telecommunications magazine connect, which has more than 20 years of editorial experience and is one of the leading test authorities in Europe for telecommunications products and services. Starting in 2014, P3 has also been conducting network benchmarks in Australia and the UK, and expanded to cover the Netherlands and Spain last year. In 2015 alone, P3 compiled more than 60,000 measurement hours in 47 countries, with its test vehicles covering more than 1.2 million kilometres. 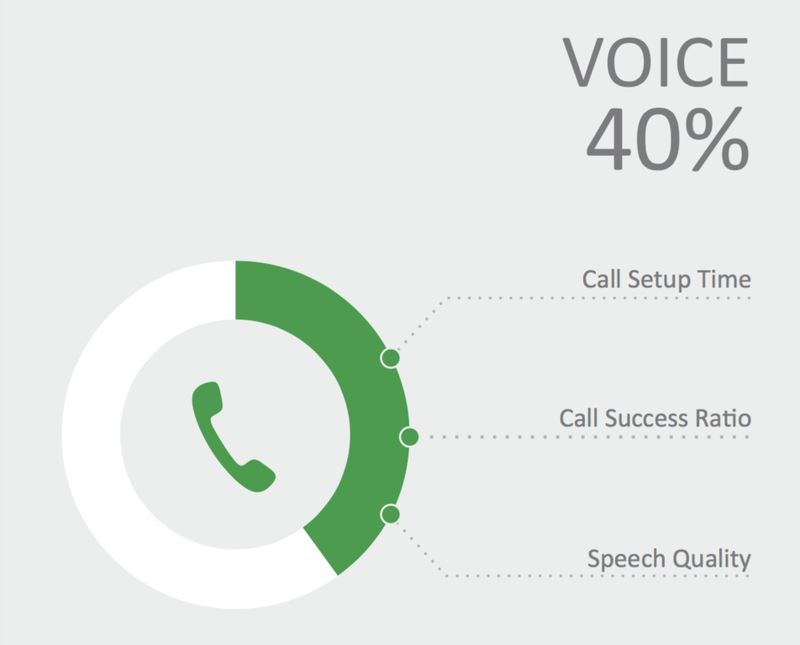 As the de-facto industry standard, the P3 benchmarking methodology focuses on customer-perceived network quality – examining both voice telephony that makes up 40% of the total result as well as data connectivity that accounts for 60% of the score. P3‘s network benchmarks are widely accepted as an objective authority. the coming year with Voice over LTE and extended 4G coverage."